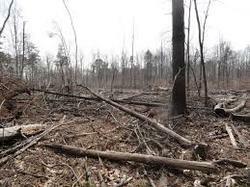 (BLOOMINGTON) - An Indiana lawmaker plans to reintroduce legislation to protect the state's forests after seeing the outcome of a timber cut that removed more than 1,700 trees. Democratic Rep. Matt Pierce toured the Yellowwood State Forest Thursday now that logging has finished. The state forestry division sold the timber to loggers for $110,000. Pierce introduced a bill in 2014 that would've protected the forest, but it failed to pass. Pierce says he's concerned about the devastation left in the wake of the logging. He says he hopes to see up to 40 percent of state forests protected from logging.